We're often asked by our customers what shoes would go best with our renaissance and medieval costumes, thus we're proud to introduce a new line of shoes and boots specially chosen to compliment our clothing styles. 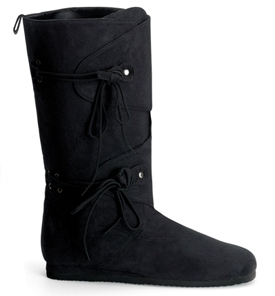 These tall boots wrap around the leg and lace shut for the best fit. Crafted of a soft, microfiber suede material and featuring a rubber sole for comfort and durability.